OMWay Solar Fountain Pump, Solar Powered Bird Bath Fountain, Solar Birdbath Fountain, Solar Water Fountain, Water Fountain Pump, Outdoor Floating Solar Bird Bath Fountain Pump for Garden Pond Pool. | Fountain City Art Ctr. 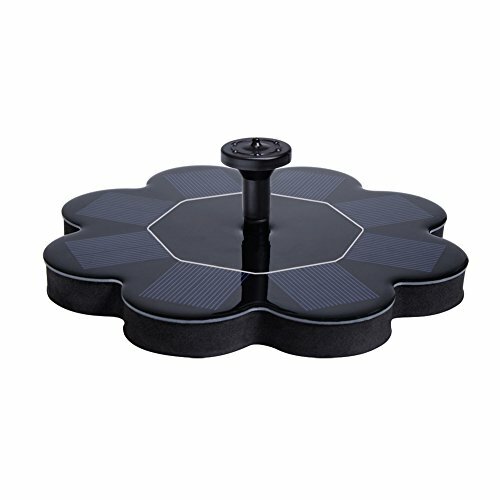 【Solar Powered Bird Bath Fountain】This solar fountain pump applies patented 1.6W solar panel, pumping stronger than most panels of 1.4W in the market. 【Solar Fountain Pump】Small size and high power with floating solar panel fit most bird bath, fish tank, pond and swimming pool. 【Keep it Clean】Please ensure the water is sufficient and clean and nothing shades the panel or block the pump. 【4 Nozzles】4 replacement nozzles offer different water shapes and heights. Feel free to choose your favorite one to fit your bird bath/pool/pond. 【Garden Decor】 This solar water fountain will attract birds to drink, which makes it a great garden decoration. If you have any questions about this product by OMWay, contact us by completing and submitting the form below. If you are looking for a specif part number, please include it with your message.